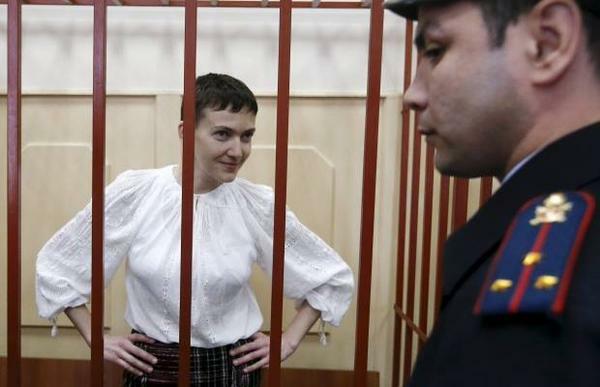 On April 17, 2014, Vladimir Shreydler, a reporter with the Russian NGO Za Prava Cheloveka [For Human Rights] attended the hearing of Nadiya Savchenko in Moscow’s Basmanny District Court, and spoke with her, as well as her attorneys. Read the interview with the attorneys Nikolay Polozov and Ilya Novikov here. Nadiya Savchenko has been detained by the Russian authorities since June 2014, on charges of being complicit in the deaths of two Russian journalists during the war in Donbas. Despite a large body of evidence provided by Nadiya’s attorneys, which proves her alibi, the investigation refused to release her or even replace her pretrial detention with house arrest. To protest the continuing detention, Nadiya declared a hunger strike on December 13th. After 83 days of hunger strike (including ten days without glucose injections), she agreed to receive small amounts of food to sustain her life. According to her attorneys, her state of health is satisfactory at the moment. Nadiya Savchenko is a PACE delegate and, as such, has immunity that makes her ongoing detention illegal. During the latest hearing, the court refused to recognize her immunity and continued her detention. Please click on “Settings” to enable subtitles. This entry was posted in #Free Savchenko, English, News, Pictures, Video, War in Donbas and tagged #FreeSavchenko, #freesentsov, #Human_Rights, #Nadiya Savchenko, #RussiaInvadedUkraine, #SaveUkraine, #StopRussianAggression, #UkraineUnderAttack, hunger strike, Russia, Ukraine, warinDonbas. Bookmark the permalink.